Todd Pletcher lost the likely Kentucky Derby favorite when he pulled Eskendereya out of the race with a leg injury on Sunday. He may have found a sentimental favorite instead in filly Devil May Care. Owner John Greathouse will enter the 3-year-old filly in the Run for the Roses, one of four shots the Eclipse Award-winning trainer has at ending his 0-for-24 Derby hex. "I'd dearly love our filly to be the one to break this deal for him," Greathouse said. "He's done a lot for me. We've had seven horses with him and three are Grade 1 winners." Including Devil May Care, who won the Frizette at Belmont last fall and is coming off a solid victory in the Bonnie Miss at Gulfstream Park on March 20. Greathouse had the filly - who is named after a James' Bond novel - pointed toward the Kentucky Oaks before Eskendereya was injured. The injury did more than simply open up the field - Lookin At Lucky is now the expected favorite - it also meant jockey Johnny Velazquez was available. Velazquez has piloted Devil May Care in all three of her career victories. "I think it was ultimately the deciding factor, not only that Johnny's available but why he's available," Pletcher said. Greathouse was considering entering her in both the Oaks and the Derby and waiting until the post draw to make a decision. Yet he tipped his hands about his intentions on Monday morning when Devil May Care came out for her gallop wearing a Derby saddlecloth. "You noticed that, huh?" Greathouse said with a laugh. Pletcher nominated the filly for the Triple Crown in January, saying he felt there was more than a passing similarity between Devil May Care and Eskendereya. Those comparisons appeared to be ill-conceived in February when she struggled to a distant fifth in the Silverbulletday Stakes at the Fair Grounds under jockey Javier Castellano. Greathouse joked that he was "suicidal" afterward, but Devil May Care bounced back a month later in the Bonnie Miss, where Velazquez guided her to a relatively easy 2@3/4-length win. Suddenly, the Derby was in sight. And make no mistake, Greathouse doesn't consider his rising star a field filler. He's here to win. "When you get an exceptional animal, you've got to give them a chance to do exceptional things," Greathouse said. Three fillies have won the Derby, the last being Winning Colors in 1988. Winning Colors was trained by Hall of Famer D. Wayne Lukas, Pletcher's mentor. Lukas, like Pletcher, struggled in the Derby early in his career. He was 0-for-12 heading into the 1988 race before Winning Colors edged Forty Niner by a neck, the first of his four Derby triumphs. Pletcher has already proven he can lead a filly to a Triple Crown win, guiding Rags to Riches to a narrow victory over Curlin in the 2007 Belmont. 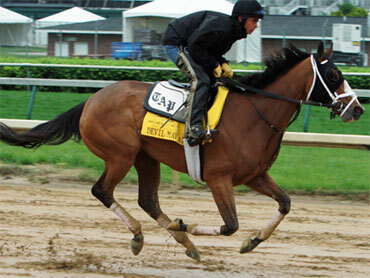 He was already planning on running Devil May Care in the Belmont before the opportunity to run in the Derby opened. "She's an exceptional filly, we've always felt that way," Pletcher said. "Obviously, with the big horse coming out yesterday the field is very wide open, and I think she deserves a chance."